We’d love your help. Let us know what’s wrong with this preview of Far from Agrabah by Aisha Saeed. To ask other readers questions about Far from Agrabah, please sign up. Thanks to Netgalley and Disney Book Group for a digital galley in exchange for an honest review. If you're familiar with the 1992 animated Disney film, you'll fall into this book fast. The story picks up after Aladdin and Genie have met, after Aladdin and Jasmine meet at the market, and once Aladdin has decided to dress up as Prince Ali of Ababwa. In fact, we're about to get on that magic carpet and venture into " a whole new world." Genie is able to think fast and create his fictional prince, a fictional kingdom in no time at all. This review has been hidden because it contains spoilers. To view it, click here. 3.5 stars, rounded up. This is basically a tale of Aladdin and Jasmine’s date on the magic carpet during the singing of “A Whole New World.” I’ve always loved that part of the movie, and it was nice to see it expanded upon in book form. There was more dimension to Jasmine and I really liked that she wanted to be a good leader to the people of Agrabah. Aladdin really milked that first wish of being a prince - even getting the Genie to create the fictitious city of Ababwa! Lengthening their date m 3.5 stars, rounded up. Far from Agrabah was a fresh take on Disney's Aladdin. It's a fun addition to the original movie, and definitely a must-read for fans! I do wish that there would've been more scenes before the start and after the end of the book, though I definitely enjoyed what I read. Full review will be up on my blog closer to release! Aladdin: Far From Agrabah begins with Prince Ali trying to impress Princess Jasmine and follows them through the magic carpet ride which allows her to get to know him and totally changes how she feels about him. It’s mostly off-script from the original story, something that could have happened in a deleted scene. In the original animated movie, we don’t really get to know Jasmine very well. We learned about her desire to marry for love and her frustration at being kept apart from her kingdom. But Aladdin: Far From Agrabah begins with Prince Ali trying to impress Princess Jasmine and follows them through the magic carpet ride which allows her to get to know him and totally changes how she feels about him. It’s mostly off-script from the original story, something that could have happened in a deleted scene. In the original animated movie, we don’t really get to know Jasmine very well. We learned about her desire to marry for love and her frustration at being kept apart from her kingdom. But in this book, we get to know her much more deeply. She dreams of things much bigger than marriage. She wants to lead her people. Jasmine wants to make a difference in their lives. She has ideas she wants to try if only someone would give her a chance. Aladdin treats her as his equal, and never acts as though this is noteworthy. He wants to impress her with his wealth and prestige, but clearly considers her thoughtful and worthy of his respect. They make a great team, and the story really captures that partnership dynamic to their relationship. Interspersed through the story are snippets from a history that Jasmine studies about great leaders. I liked how the story tied the lessons from history into the present through the moral lessons the leaders learned. It wasn’t preachy at all, but made the book seem like so much more than a fairy tale. Aladdin: Far from Agrabah is a fun take on the story we know and love. It picks up right when Aladdin is taking Jasmine out on their magic carpet ride – but it turns out that there’s a lot more to this quick trip around the world than meets the eye. Aladdin and Jasmine will learn a lot not only about themselves but the world around them during the adventures they take. I loved Aisha Saeed’s take on the characters. To put your own spin on classic characters who are well loved by fans is not an eas Aladdin: Far from Agrabah is a fun take on the story we know and love. It picks up right when Aladdin is taking Jasmine out on their magic carpet ride – but it turns out that there’s a lot more to this quick trip around the world than meets the eye. Aladdin and Jasmine will learn a lot not only about themselves but the world around them during the adventures they take. I loved Aisha Saeed’s take on the characters. To put your own spin on classic characters who are well loved by fans is not an easy task, but Aladdin and Jasmine feel like the people I know while still having some new and interesting sides to them. Jasmine in particular is extremely intelligent and ambitious, with dreams of being sultana and ruling her kingdom justly. In some ways it reminded me of the Beauty and the Beast novel, Lost in the Book. It takes a story we are already familiar with and inserts a new tale that we didn’t realize could be happening. In Lost in a Book it’s Belle’s adventures in the library, and in Far from Agrabah it’s Aladdin and Jasmine’s magic carpet ride. This story could fit in right in the middle of the movie and doesn’t really disrupt the canon at all, which is pretty cool. Aladdin Far From Agrabah tells the tale of Aladdin's second wish. Will Jasmine recognize Prince Ali on their travels on the magic carpet? This is a sweet story. Princess Jasmine is definitely a smart young woman who is not necessarily looking for love. She is refreshing. Thanks to NetGalley and Disney Hyperion for the ARC. Refreshing & Nostalgic at the same time. Such a good take on a Disney classic. You get a slight taste of the original movie; while also getting a completely brand new story. Thanks to Partner NetGalley for the digital ARC of Aisha Saeed’s Aladdin: Far from Agrabah in exchange for an honest review. The book releases on April 2. I requested Saeed’s new novel for two reasons: (1) I (and the other hosts of Unabridged) absolutely adored her own voices novel Amal Unbound, which was one of the 2018 Global Read Aloud selections, and (2) Aladdin is one of my favorite Disney movies ever. I can’t count the number of times my best friend and I watched that film when we were in h Thanks to Partner NetGalley for the digital ARC of Aisha Saeed’s Aladdin: Far from Agrabah in exchange for an honest review. The book releases on April 2. I requested Saeed’s new novel for two reasons: (1) I (and the other hosts of Unabridged) absolutely adored her own voices novel Amal Unbound, which was one of the 2018 Global Read Aloud selections, and (2) Aladdin is one of my favorite Disney movies ever. I can’t count the number of times my best friend and I watched that film when we were in high school. I am, however, not a member of this book’s target audience, and I felt that vividly through the book. A middle-grade read, Aladdin: Far from Agrabah begins with an excerpt from the fictional Legendary Leaders Across the Ages. This first section details the tragic disintegration of the friendship of Sultan Waleed and his advisor Abbas, whose greed for power and gold leads him to betray his friend. In a structure that I appreciated, these tales from Legendary Leaders continue throughout the novel, reinforcing the feeling that we’re reading a story rooted in folk tales and history and reinforcing the experiences and lessons of the book’s protagonists. Saeed launches into the story of Aladdin and Jasmine a few days after they’ve met, alternating between their points of view. Fans of the movie know that Jasmine meets Aladdin, a “street rat,” when she has disguised herself to explore the “true” Agrabah--with his knowledge of the streets, the impoverished orphan is able to keep her safe. Now, however, Aladdin has used his first wish from the genie to transform him into Prince Ali of Ababwa, a show off who is failing to impress Princess Jasmine. For a while, Saeed follows the movie, which is both satisfying for fans and a little frustrating for those who want more. The author does effectively create a character in Jasmine who yearns for real leadership opportunities: she is frustrated with her father’s distant and cold rule over Agrabah and wishes that she could act as her deceased mother did to bring real compassion to her kingdom. When Aladdin and Jasmine take off on their magic carpet ride (who else is singing “A Whole New World” in their heads? ), Saeed begins to build her own facet of the narrative. Jasmine requests a detour to visit Prince Ali’s home in Ababwa, and Aladdin uses a loophole to convince Genie to make it happen. It’s in Ababwa that the couple truly connects and also begins to develop a firm idea of what it means to be both a good leader and a good person. I appreciated so much the details of the kingdom of Ababwa, and the people Aladdin and Jasmine encounter teach them a plethora of lessons throughout their visit. It’s here, however, that I most felt my distance from the young readers at whom this book is aimed: the overly explicit expression of neatly encapsulated morals to the story left me wishing for more subtlety. These lessons fit more in the sections from Legendary Leaders but feel less an organic part of the main narrative. Saeed takes on compassion, economic disparity, education, truth, the importance of actions . . . watching Aladdin and Jasmine grow and seeing Jasmine become more determined to take on a leadership role in Agrabah (go, feminism!) offers clear character arcs but left me wishing for the more complex and nuanced Amal Unbound. New York Times best-selling author Aisha Saeed can show you the world, shining shimmering splendid, as well as a new fantastic point of view in her novel, Aladdin: Far From Agrabah. Beautifully set within the “A Whole New World” sequence from Disney’s animated film Aladdin, Saeed’s novel tells us the story of what might have happened if viewers were not swept up in the unforgettable tune by Alan Menken and Tim Rice. If Aladdin lacked its musical element, we would possibly see Saeed’s story unfol New York Times best-selling author Aisha Saeed can show you the world, shining shimmering splendid, as well as a new fantastic point of view in her novel, Aladdin: Far From Agrabah. Beautifully set within the “A Whole New World” sequence from Disney’s animated film Aladdin, Saeed’s novel tells us the story of what might have happened if viewers were not swept up in the unforgettable tune by Alan Menken and Tim Rice. If Aladdin lacked its musical element, we would possibly see Saeed’s story unfold. A love story set amid a battle for independence and acceptance, Far From Agrabah takes us to Prince Ali’s kingdom of Ababwa, teaching us important life lessons along the way. The dialogue in the story offers countless real-life solutions to the fictional characters’ problems. From politics and power to friendship and love, the tale explores in greater depth the juxtaposition of royalty and the life of a “street rat.” We glimpse Aladdin’s reality (as we did in the film), but Saeed also gives us insight into his wishes and desires, including his vision of Ababwa. The same is true for Princess Jasmine. Wishes are tricky things, as the book suggests, but Saeed (with a little help from Genie) brings them into existence for Aladdin and Jasmine in a thoughtful and intellectual way. Besides where Far From Agrabah fits in to the classic Disney story (always an important factor for me), I loved the cleverly interwoven shorts from Legendary Leaders Across the Ages. The Legendary tales set the scene for the trials and tribulations of Agrabah and Ababwa, as well as the hopes and dreams of the individuals therein. I loved that these tales paralleled the Far From Agrabah story. They added so much to Jasmine’s character and her perception of the world. A big thank you for Disney Press for giving me the opportunity to review the uncorrected advance proof of this book. Aladdin: Far From Agrabah is perfect for fans Disney's Aladdin. Aisha Saeed creatively reinvents the Disney classic we grew to love as well as retelling the original story of "Aladdin and the Magic Lamp" from The Book of One Thousand and One Nights. In Saeed's retelling of Aladdin, Saeed gives insight and a better understanding of the song "A Whole New World" with beyond the magic carpet ride. There is more to Aladdin besides the wonderful music Disney can provide was with. The novel starts with Aladdin: Far From Agrabah is perfect for fans Disney's Aladdin. Aisha Saeed creatively reinvents the Disney classic we grew to love as well as retelling the original story of "Aladdin and the Magic Lamp" from The Book of One Thousand and One Nights. In Saeed's retelling of Aladdin, Saeed gives insight and a better understanding of the song "A Whole New World" with beyond the magic carpet ride. There is more to Aladdin besides the wonderful music Disney can provide was with. The novel starts with Jasmine scanning the hall during the Harvest Festival. She had just met Aladdin a few days prior. Aladdin: Far From Agrabah is an excellent retelling that not only touches upon some of the elements people love about Disney's Aladdin, but it creates a new parallel world where readers can explore the true spirit of how Aladdin and Jasmine fall for each other. Saeed's version of Aladdin captures the heart and readers learn more about the characters' backstories and personalities. Exploring Ababwa and seeing Genie's capabilities bring a smile to my face. Aladdin is able to dazzle and wow Jasmine when he takes her to Ababwa at her insisting. Fictionalized Ababwa is an extension of Aladdin. It contains his memories of people and a history of himself. Yet, it also includes things that Jasmine would appreciate. Aladdin and Jasmine begin to bond over the memories of their lost parents. Aladdin invites Jasmine to help with an open advisory council meeting where the common people will ask Aladdin questions and for advice. Aladdin lets Jasmine be part of the meeting and treated her like an equal to listen and to dole out advice. The cartography shop was the icing on the cake for Jasmine. Aladdin is able to share desserts with Jasmine at a version of his favorite bakery. An embodiment of a younger Aladdin appears which Jasmine sympathizes with but Aladdin cannot let her know that it is him. The curveball with the real so-called villain in the made-up Ababwa is perfect. It shows that even in an ideal world, it cannot exist without some flaws. Somehow a mysterious person steals the magical carpet which puts Aladdin in a difficult situation. I am sorry for readers who are hoping that Jafar pops up in this retelling because he is not the villain in this storyline. I thought Far From Agrabah was a novelization of the new live-action Aladdin movie. It’s actually an expanded carpet ride where we get to see them fall in love and it starts in the middle of the plot of the movie. It just refers to their first meeting and we don’t see it in this story. Now I’m wondering if this story is even in the movie at all. If it’s not, you should definitely read this book because it’s a charming love story with a fairy tale adventure. 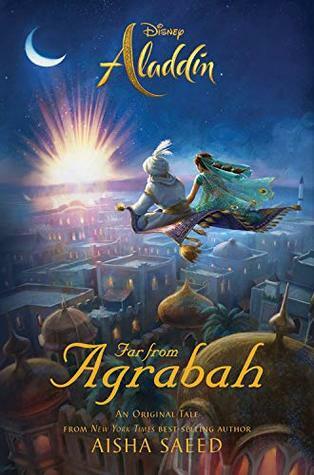 The first thing I noticed when I read F I thought Far From Agrabah was a novelization of the new live-action Aladdin movie. It’s actually an expanded carpet ride where we get to see them fall in love and it starts in the middle of the plot of the movie. It just refers to their first meeting and we don’t see it in this story. Now I’m wondering if this story is even in the movie at all. If it’s not, you should definitely read this book because it’s a charming love story with a fairy tale adventure. The first thing I noticed when I read Far From Agrabah was there were fairy tales spread throughout the book. They are children stories from Agrabah kind of like Tales of Beedle the Bard for Harry Potter. They were interesting but it took a while to see why they were relevant to the story. My favorite one was about Zayn the Tenth that had a Beauty and the Beast type of beginning. Jasmine and Aladdin felt like authentic characters in a magical setting. I could see the double meanings behind what Aladdin would say sometimes. Like when he comments that he should get one of those books. As a prince, it sounds conceited but as a poor boy it sounds wistful. Aladdin gives humble advice to help others and asks for Jasmine’s input. She’s flattered and surprised that someone sees her for her wisdom and not just her status. I could see why Jasmine starts to like him. And when his prince disguise comes off as strange she decides to think kindly of him anyway. In fact, Jasmine said my favorite quote in the whole book. When Jasmine starts to realize who Aladdin really is, she has already seen his good heart on their adventure together and she decides to trust that he has a good reason for not being up front with who he really is. Aladdin decides on their adventure to act with integrity even though he doesn’t have to. But that’s what’s great about reading books. You get to see the motivations and thoughts of the characters and this book did a great job with both Jasmine and Aladdin. I got to know them in ways that it’s hard to do in a movie. And the end is when I saw the connection to the fairy tale. The sultan in the last fairy tale acts like Aladdin did. He shows integrity when he doesn’t need to. I received an advanced reader copy of this book from the publisher, Disney Book Group, via NetGalley in exchange for my opinions. Where did Jasmine and Aladdin go that night their Magic Carpet Ride? What happens when Jasmine wants to see Ababwa, the Kindgom where Prince Ali hails from? This was a wonderful story about what happens that night. We already know the story of Jasmine and Aladdin from the movies, but Aisha Saeed takes in depth to the night when Aladdin, still trying to woo Jasmine, whi I received an advanced reader copy of this book from the publisher, Disney Book Group, via NetGalley in exchange for my opinions. This was a wonderful story about what happens that night. We already know the story of Jasmine and Aladdin from the movies, but Aisha Saeed takes in depth to the night when Aladdin, still trying to woo Jasmine, whisks her away on the magic carpet. After many glorious sites, Jasmine asks to go to Ababwa. With Genie's help, Aladdin takes her to his made up kingdom. Jasmine has, most recently, lived a very secluded, dull, "safe" life. Her father wants to keep her protected and out of harms way. We discover, that it was not always this way. Jasmine's mother had been grooming her daughter to be a leader, including her on diplomatic meetings and such. Jasmine misses this and knows she can do more to help her kingdom of Agrabah, but her father, and his advisor won't let her. Aladdin, who became an orphan at a young age, has many ideas of how he would improve life for the citizens of Agrabah with no way to implement them. When Genie creates Ababwa in Aladdin's eyes, and he has the chance to see his ideas in action, as does Jasmine. In fact, the two of them work together to create new ideas and plans how to help both Ababwa and Agrabah citizens. Over time, Jasmine is reinvigorated about how she can lead Agrabah and is excited to return home to help her father lead. Meanwhile, Aladdin is realizing that the love and notoriety of being the Prince of Ababwa is feeling empty and shallow, as he knows it is all a creation of the Genie, he desires to work at being that person in reality. He knows he has to earn Jasmine's faith and admiration as Aladdin, not Prince Ali. I really enjoyed this fresh take on Aladdin. I have always been a huge fan of the movie so revisiting this world made me feel like a child again. Aladdin: Far From Agrabah is sure to be a hit with the midgrade audience. The writing was on par for mid-grade novels, and It was relatively fast-paced, One thing that I enjoyed the most was the fact that it added a new story to a classic Disney movie. I forgot how much I missed Alad I received this book from NetGalley in exchange for an honest review. I really enjoyed this fresh take on Aladdin. I have always been a huge fan of the movie so revisiting this world made me feel like a child again. Aladdin: Far From Agrabah is sure to be a hit with the midgrade audience. The writing was on par for mid-grade novels, and It was relatively fast-paced, One thing that I enjoyed the most was the fact that it added a new story to a classic Disney movie. I forgot how much I missed Aladdin so it was fun to take a few days revisiting old friends. One thing that I really wished this novel had was more of the back story. I felt that this book needed background. If I didn't grow up watching Aladdin as a child, I would have never known what was going on. I desperately wanted the background and I feel that this book does a disservice to readers who have never explored Agrabah before. I received a copy of this book from Disney Book Group is exchange for an honest review. I believe this story could have been enriched with starting from the actual beginning of the story that most people are familiar with. Instead of starting with how Jasmine and Aladdin meet, the reader starts out at a festival with Jasmine handing out candy to children while hopeful suitors linger around and try to impress her. Jasmine is a strong woman and wants to make a positive impact on the lives of her pe I received a copy of this book from Disney Book Group is exchange for an honest review. I believe this story could have been enriched with starting from the actual beginning of the story that most people are familiar with. Instead of starting with how Jasmine and Aladdin meet, the reader starts out at a festival with Jasmine handing out candy to children while hopeful suitors linger around and try to impress her. Jasmine is a strong woman and wants to make a positive impact on the lives of her people. She wants nothing more than to help those in need, but often her ideas are pushed to the side and ignored by her father and his adviser. The main meat of this story takes place during her magic carpet ride with Aladdin. We get to explore new places with them, and even spend a good amount of time in Ababwa. This is a fast read and we get to see more of what makes these characters tick, other than the glimpses we are given in the Disney movie. This is a must read for all Aladdin and Disney fans. I received an electronic ARC from Disney Book Group through NetGalley. Saeed takes the reader through what happens on the night Prince Ali and Jasmine meet and then Aladdin and Jasmine fly around the world on Magic Carpet. They see the sights and then land in Prince Ali's kingdom of Ababwa. Genie outdid himself creating an entire kingdom based on Aladdin's life and wants. The two have incredible adventures in the palace and in the kingdom. Both Aladdin and Jasmine learn more about themselves and I received an electronic ARC from Disney Book Group through NetGalley. Both Aladdin and Jasmine learn more about themselves and what kind of rulers/humans they want to be. The author captures the mood and vividly describes the scenes so readers can picture the setting and still have room to add their imagination to the mix. Throughout the book, Saeed weaves legends that allow readers to make connections to what is happening in the story. I received this book as an ARC from Disney Book Group in exchange for an honest review. Opinions and thoughts expressed in this review are completely my own. This is by far one of my favorite Disney tales of all time. I am a huge fan of Aladdin and the characters so when I heard that there was a modern rendition of this classic tale, I immediately had to jump at the chance and read it. I was NOT disappointed at all. Reading this book brought Joy to my day and a smile to my face reading all about I received this book as an ARC from Disney Book Group in exchange for an honest review. Opinions and thoughts expressed in this review are completely my own. This is by far one of my favorite Disney tales of all time. I am a huge fan of Aladdin and the characters so when I heard that there was a modern rendition of this classic tale, I immediately had to jump at the chance and read it. I was NOT disappointed at all. Reading this book brought Joy to my day and a smile to my face reading all about my favorite characters and having flashbacks of some wonderful childhood memories. From beginning to end it just got better and better. Such a treat to read and I can't wait for the response and circulation this book will have for our young readers. It was a delight to take a magic carpet ride with Aladdin and Jasmine and visit the fictional kingdom of Ababwa. Included with their story were chapters telling of other kingdoms -- some characters crossed over to interact with Aladdin and Jasmine while some did not. It seemed a bit disorganized. Also since I was viewing an ARC I missed out on all the illustrations that would have elevated the effect of the narrative. Readers who love the story of Aladdin will fall in love with this tale, but it It was a delight to take a magic carpet ride with Aladdin and Jasmine and visit the fictional kingdom of Ababwa. Included with their story were chapters telling of other kingdoms -- some characters crossed over to interact with Aladdin and Jasmine while some did not. It seemed a bit disorganized. Also since I was viewing an ARC I missed out on all the illustrations that would have elevated the effect of the narrative. Readers who love the story of Aladdin will fall in love with this tale, but it will not appeal as much to those who are not big fans. This was cute, but it wasn't Earth shattering. It asks and answers the simple question "when Aladdin and Jasmine are flying around on the carpet, what would happen if she asked to visit Ababwa, Aladdin's fictional kingdom?" That's pretty much it. There are some weird interstitial chapters that I honestly skipped half of, and a random villain introduced that was your standard Disney fare, but it was pretty meh overall. 3.5 stars. I love Aisha Saeed, and I think she did a great job of making this book accessible for middle-grade readers while bringing more depth to the characters (Jasmine in particular). I don't think this book will translate as well to adults, as Saeed very much caters to her target audience, but I think it's a fun read for those who have seen the 1992 film. This review has been hidden because it contains spoilers. To view it, click here. It was okay. I felt it dragged. I found the random legends disjointed. And while for almost all of them, I could trace some evidence of how they pertained to the main plot, I felt they were unnecessary delays. An exciting tale of the adventure Prince Ali and Princess Jasmine had on their magic carpet ride. "A whole new world" is given new meaning when they visit Ali's fictitious kingdom Ababwa, a fantastical place created by Genie. Lovers of Aladdin will enjoy this new twist on the old tale. A fresh take on Disney’s Aladdin tale where Aladdin, as Prince Ali, and Jasmine have a day-long adventure in Ababwa. Will be fun for young adults or middle grade readers. I appreciate the opportunity from NetGalley and the publisher to read an advance copy of this book in exchange for my honest review. I enjoy retellings of familiar stories, so I was thrilled to find Aladdin:Far from Agrabah on NetGalley, as I hadn't read an Aladdin retelling previously. This book did a perfect job of blending the familiar with the new, original story parts. Readers get to know Aladdin and Jasmine more closely, which is something I look for in retellings. Definitely recommend this I appreciate the opportunity from NetGalley and the publisher to read an advance copy of this book in exchange for my honest review.